PULLMAN, Wash. – Researchers know that adding natural buffers to the farm landscape can stop soil from vanishing. Now a scientist at Washington State University has found that more buffers are better, both for pleasing the eye and slowing erosion. Linda Klein, a recent doctoral graduate in WSU’s School of the Environment, worked with six other researchers at the university, plus one at the U.S. Department of Agriculture’s Moscow (Idaho) Forestry Sciences Laboratory, to explore the role that buffers – strips or clumps of shrubs, trees and natural vegetation – play in the landscape and in people’s visual preferences. Klein surveyed Whitman County residents to see if conservation features made for more scenic fields and valleys. She found that Palouse residents prefer more nature with their wheat fields. Whitman County’s rolling hills have some of the highest wheat yields in the world, but they are also prone to erosion. Conservation efforts have helped stop some of the loss, but a mix of factors, including economics, means most farmers haven’t adopted broad measures. Results showed that trees and shrubs on hillside drainages – shallow channels between hill slopes – have the greatest potential to slow erosion, compared to buffers along streams or on the steepest slopes. To gauge visual appeal, Klein used image simulation technology and mailed survey booklets to 1,200 rural and urban residents of Whitman County. 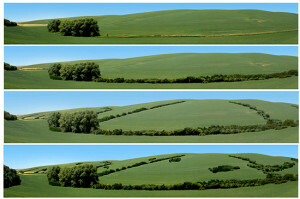 Respondents were asked to rate landscape images, starting with a baseline of mostly monoculture grain fields, then gradually altered to show more buffers – first on stream banks, then adding hill slope drainages and finally adding steep slope vegetation. Klein found people preferred more buffers in the landscape. However, she found no statistically significant difference between their preference for landscapes with both stream and hill slope buffers – the second highest amount of natural vegetation – and those with buffers added to steep slopes. Past research shows that people prefer park-like landscapes. 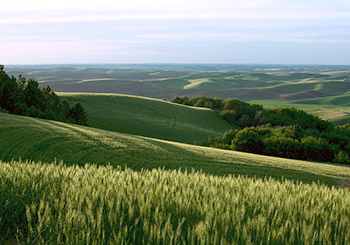 Klein suspected respondents would lean that way – in spite of the Palouse landscape’s iconic status. “I did the study in a landscape that’s renowned for being beautiful,” she said. One implication of Klein’s findings is that visually appealing agricultural land may also be ecologically better. “By looking at a landscape and seeing these buffers, you could imply the landscape is healthier,” she said. “Agricultural sustainability is not only providing food to feed people, but also protecting the resources we depend on to produce the food: the soil, the water,” Klein said. The research paper can be found in the February edition of “Landscape and Urban Planning:” Klein, L. R., Hendrix, W. G., Lohr, V. I., Kaytes, J. 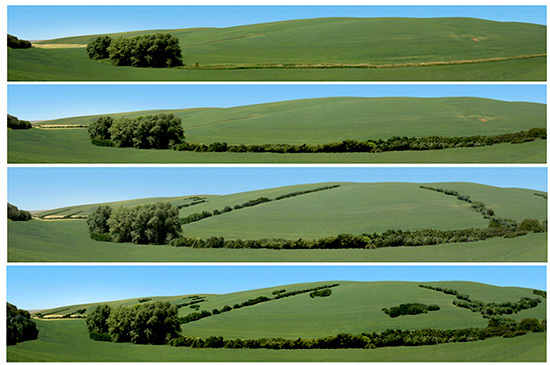 B., Sayler, R. D., Swanson, M. E., Elliot, W. J., and Reganold, J. P. (2015) Linking ecology and aesthetics in sustainable agricultural landscapes: Lessons from the Palouse region of Washington, U.S.A. Vol. 134:195-209 doi: 10.1016/j.landurbplan.2014.10.019.